The Georgia O’Keeffe Museum has engaged a multi-disciplinary team, led by Pamela W. Hawkes FAIA of Scattergood Design and Michael C. Henry PE AIA of Watson & Henry Associates, to develop a comprehensive Conservation Assessment for the Home and Studio of the American modern artist Georgia O’Keeffe. O’Keeffe (1887-1986) is recognized as one of the most significant artists of the 20th century. The site in Abiquiú, New Mexico, located about 50 miles northwest of Santa Fe, exemplifies her singular modernist aesthetic and served as the inspiration for some of her most significant works, such as the In The Patio series and Winter Road. 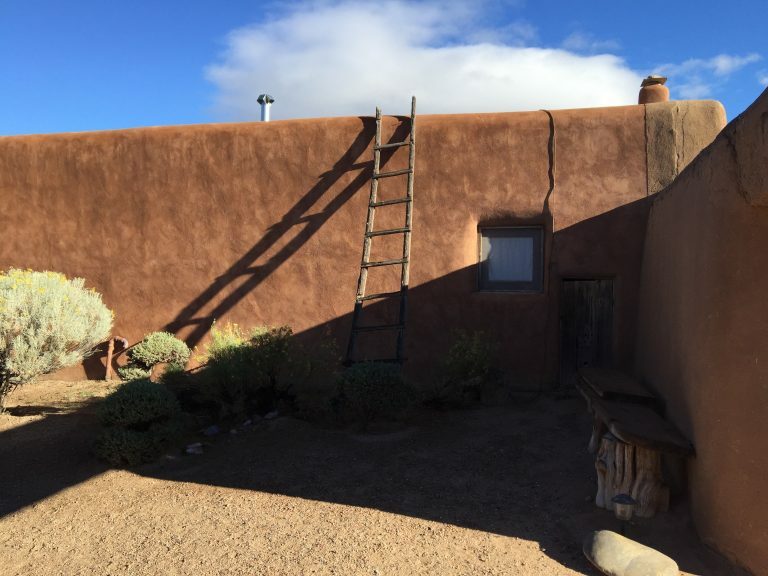 In the 1940s, O’Keeffe purchased the abandoned 18th century adobe house, incorporating modernist elements in its restoration, such as oversized plate glass windows and skylights. Presently, the Home and Studio is part of the Georgia O’Keeffe Museum, and is a National Historic Landmark. Open to the public, it has experienced sharp increases in visitation in recent years. The Conservation Assessment, which includes documentation and monitoring, will focus on long-range preservation strategies for the unique assemblage of traditional materials and modern aesthetic. The final report will guide the historic site’s interpretation and conservation. Other team members include: Peter Aaslestadt, Aaslestadt Preservation Consulting, photogrammetry and three-dimensional imagery; Anthony Crosby, adobe conservation; Dorothy Krotzer of Building Conservation Associates, finishes conservation; and Atkinson-Noland & Associates, structural engineers. The Georgia O’Keeffe Museum opened to the public in July 1997, eleven years after the death of its namesake. In addition to the main Museum campus in Santa Fe, the O’Keeffe Museum maintains O’Keeffe’s two residences in northern New Mexico, an Education Annex, Library and Archives, and a variety of collections relating to O’Keeffe and modern art. Previous PostDave Woodham presents paper on historic bridge evaluation.